Our farm is here for the preservation of a vanishing way of life. Over the years service animals have been changed and not, in our opinion, for the better. This breed, one of the, if not THE, oldest American pigs adapts well to pasture and is very self sufficient, and friendly. We believe that to truly benefit both our service animals and ourselves we need to treat them humanely and give them a good life without undue stress, while adding an element of fun into the mix. In return they provide us with health promoting food rather than the pale imitation, laden with destructive hormones and antibiotics, found in the produce of factory farms. We are a small family of 2 sisters and a cousin who began our endeavor in 2008. A retirement adventure in tune with our philosophies and preferences. 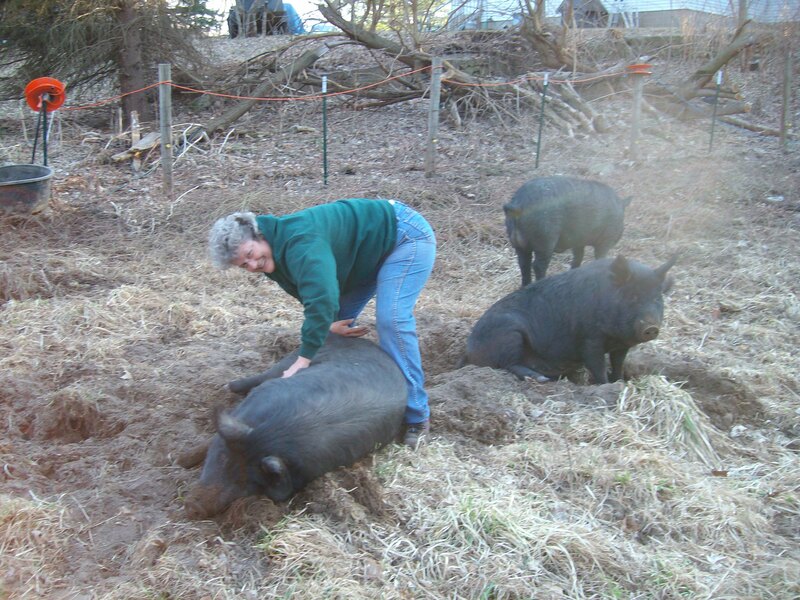 Pat decided to keep heritage chickens, while BJ discovered this wonderful breed of pig and we decided to raise those as well. Nancy did a LOT of research and here we are. Barb has always been our gardener extraordinare, and keep the family in fresh veggies summer and winter. Mark and Jessica are to thank for the geese! Barb's next foray into husbandry is adding a few turkeys next year.